hardwood floor cleaning - Professionally. You must be asking yourself, "Why do I need it?" After all you handle your own household chores including your own floor cleaning. So, why would you need a professional floor cleaning? How clean is clean? How about time? Quality? And cleaning product knowledge? Let's say you're in a bind, tight for time and simply have too much to do, for that big party or get together. Or you have that busy, busy office, retail store or restaurant that simply don't have enough time or know how to do a proper floor cleaning. After all, your not in the business of "floor cleaning". Not to mention to do a really good quality job at cleaning can be a tough task. What's the point of cleaning, if it doesn't make an impression? Or is it because, you don't know what type of floor cleaning solution to use for your specific wood floor finish. You wouldn't want to risk damaging your wood floors. Which can lead to costly repairs. This is why you need a professional floor cleaning. 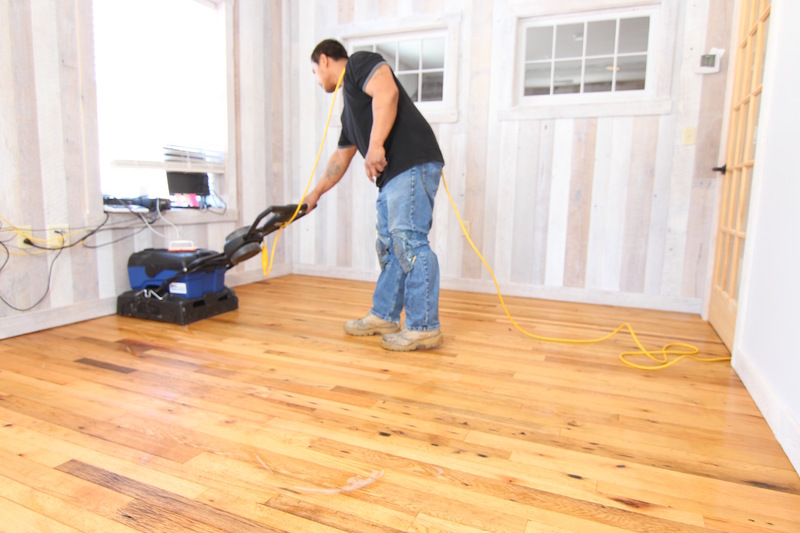 In-fact, manufacturer's recommend you have your hardwood floors professionally cleaned once a year, to remove polish and build-up, that has accumulated from daily floor cleaning. We have a commercial floor scrubber, that washes, scrubs, rinse and dries. Our floor scrubber can get deep into the grains, removing dirt and oil that has been trapped in there. Bringing back the original shine, streak free. 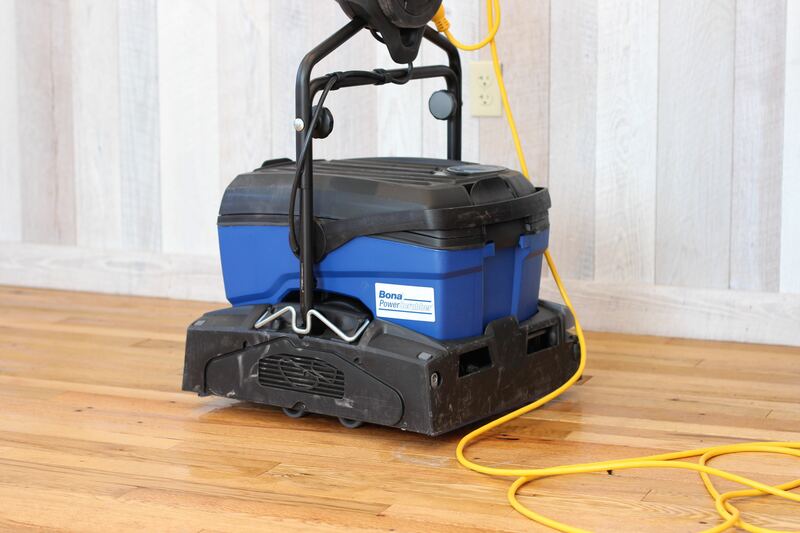 Perfect for giving your pre-finished floors a deep cleaning. The cylindrical brushes can remove the dirt and oil trapped in the beveled edges of pre-finished floors. What are you waiting for contact us! We use special formulated ph neutral cleaning solutions, specific to your wood floor finish. 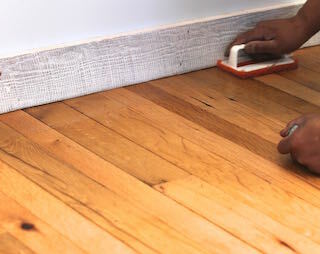 To ensure that your hardwood floors gets a safe hardwood floor cleaning, bringing back the original shine, streak free. And not damaging or dulling your wood floor finish. 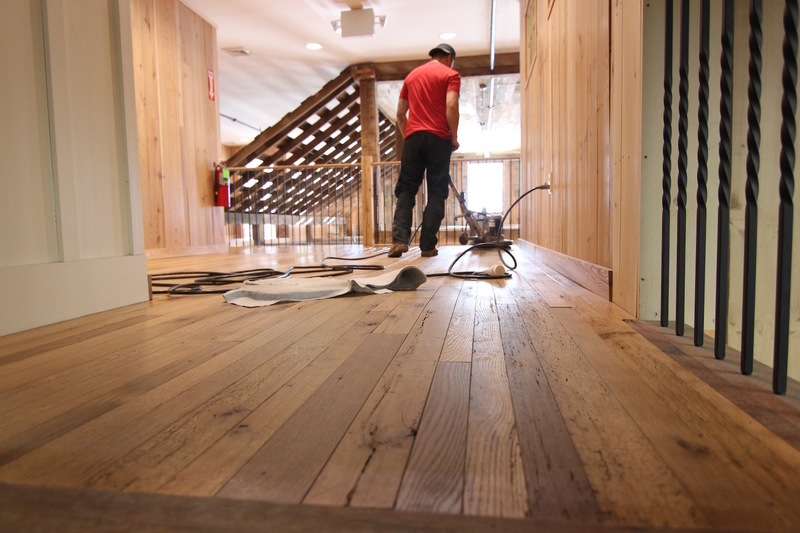 Nothing better, than having pros that apply the wood floor finish, properly maintain them for you. Polish and wax build up? No problem, our cleaning solutions can strip and remove polish and wax build up safely, with no damage to the protective coating. Polish and wax will prevent adhesion for a new top coat. Wax can get slippery and dangerous. Have them deep clean and make them safe for your home and business. So, what are you waiting for? Still not convinced that you need a professionally hardwood floor cleaning? How about cleaning product knowledge? Most home owners are using the wrong cleaning product to clean their wood floors, due to their lack of knowledge. You are damaging your wooden floors. How, must you ask? Let's face it, when we are out at the home centers. Trying to pick out the floor cleaner for our hardwood floors. If, it says, "hardwood floors". We automatically think it is safe to use. You cannot be so incorrect. The information, we need to look for is. Are they safe for polyurethane finishes, oil finishes, aluminum oxides or uv cured finishes? Did you know, not all these cleaning solutions are available to the regular home owners. This is because cleaning solutions for oil and uv cured finishes, are made for professional use only. And there are tons of these finishes out there. Do you know which wood floor finish you have? We do! This is why, you need to have a professionally floor cleaning. Buff and re-coat or hardwood floor cleaning? Did yo know, that some professionals due to a lack of knowledge or resources will always recommend a buff and re-coat. It's the only thing, they know or can do. Buff and re-coats takes time, smells and causes havoc to your daily routine and turns your home and business upside down. Re-coats should only be done when needed, usually 3-5 years after the original coating has been applied. So, why why are your buffing and re-coating your floors constantly just to keep up the shine? There is no need to. Avoid the buff and re-coat, a hardwood floor cleaning is all you need to bring back the original shine. Get on a yearly plan at a discounted price for an annual hardwood floor cleaning. Schedule a floor cleaning as part of your spring cleaning or schedule a floor cleaning before the holidays. It's all about making an impression.What are you waiting for contact us! We take it, beyond floor cleaning. If, your wood floors are slightly worn, but still in good shape. How about a dustless re-coat? What is a dustless re-coat? A dustless re-coat is a strip, hardwood floor cleaning, etch and re-coat. No sanding or buffing is involved. Minor scratches will get filled in with a new fresh coat. You never have to leave your home. It's fast, clean, safe and dust free. What are you waiting for contact us!